The plants nominated are selected on their observed performance in Melbourne (the suburbs, rather than the more benign mountain environments nearby). There are enough similarities in climatic conditions in other locations in southeastern Australia that the nominations can be expected generally to be among the "hardier" of choices for the garden. 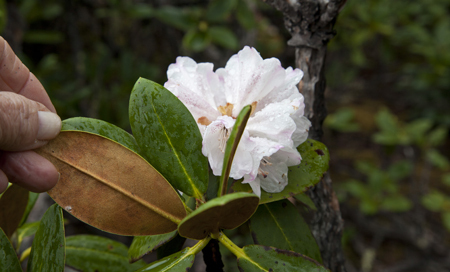 GENERAL COMMENTS : Asiatic rhododendrons which have indumentum (hairs) under their leaves are well worth considering. The foliage has added decorative appeal (a feature to be enjoyed particularly in the non-flowering period of the year) and is long-lasting, and the indumentum provides added resistance to insect attack (especially against lacewing). Also yellow and purple flowered plants are less likely to thrive under high summer temperatures. AUSTRALIAN HYBRIDS : Many of the hybrids which were grown here in the early days (many still grown even today) were raised in England or Holland to suit conditions there. In general, their special requirements were that the plants should be cold-hardy and that they should flower late in the season to avoid their hard frosts. Here in Australia, our requirements in these two respects are quite different. We need plants which are heat-tolerant and preferably drought-tolerant, but which do not need to be particularly cold-hardy. Furthermore, we want plants which flower early in the season to avoid our hot weather with its accompanying dry winds which can ruin flowers in one day unless they are very well sheltered. A good deal of work has been done both by nurserymen and amateurs with these aims in mind, and there are now many hybrids available which suit our conditions quite well. 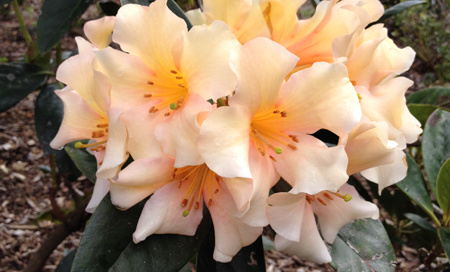 Many can be seen in the "Australian Hybrids" section of the Rhododendron Garden at Olinda. A few appear in the list - indicated by an asterisk * after the name. Our message to Australian gardeners is: don't overlook Australian hybrids! These remarks so far refer to the Asiatic rhododendrons. So far as vireyas are concerned, many of the hybrids available in the trade here today have been raised in Australia, and naturally selections have been made with our requirements in mind. The fact that vireyas collectively flower throughout the year overcomes some of the problems discussed earlier regarding desirable flowering times, remembering, however, that as most are tropical (although typically not native to the hottest zones, but rather growing at relatively cooler altitudes), care needs to be taken even with our mild frosts. Many of the small species and hybrids are available if you look for them, and should be considered seriously for use in the smaller suburban garden, or even for a town house balcony. You get more variety per square metre of garden with them. As a general rule, the smaller the leaf size, the smaller the plant (or, at least, a plant which will flower while still quite small and which can then be kept down in size by judicious pruning after flowering). Nature, of course, does not stick fast to such generalisations, and some specific knowledge is required for precision in predicting mature size of plants. This can be obtained from appropriate reference books, from experienced nursery growers, or from experienced amateur growers such as members of the Australian Rhododendron Society. Due to our different conditions, figures given in overseas books may not apply here.